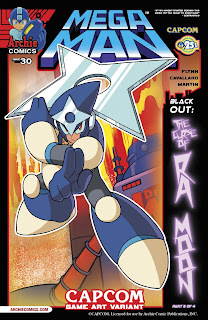 It's the ultimate rumble-in-the-jungle for the fate of the planet in "BLACKOUT: The Curse of Ra Moon" Part Two! 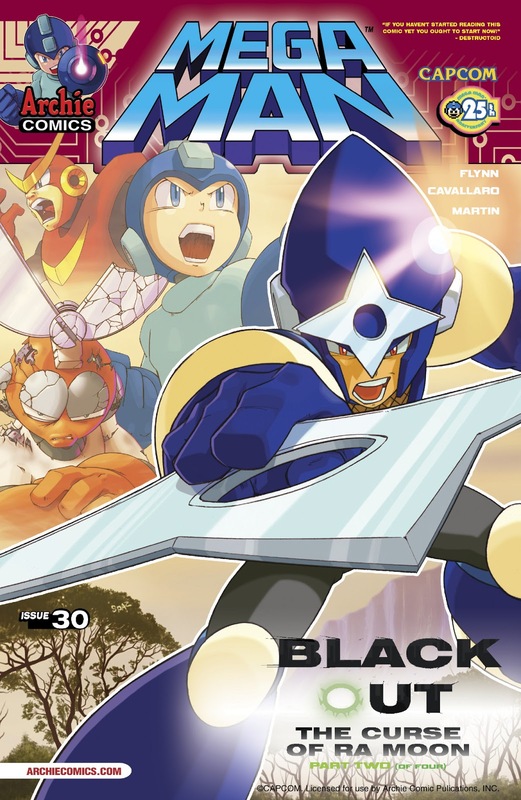 Mega Man leads Cut Man, Guts Man and Bomb Man through the Amazon in a desperate attempt to save the world! But standing in their way are TWO sets of Dr. Wily’s Robot Masters! Things escalate even further when Break Man appears, but is he there to fight Mega Man—or to help? Featuring new cover art from PATRICK "SPAZ" SPAZIANTE and a special Capcom video game-inspired variant cover! First thing I noticed about this cover was how nice the artwork is. It says a lot and is pretty intense. I like the interesting blend of the nature setting below as well.